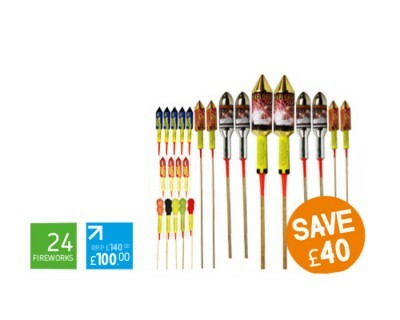 A terrific pack of rockets at a bargain price. Go on fill your boots! You won't find better at this price! Another of our legendary rocket packs. Great value! Great variety! All chosen by us for their great performance! A very popular pack at an attractive price. 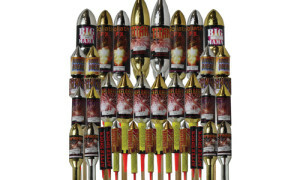 Featuring our top rockets, from the double burst of the Gemini rockets to the newly designed Big Mama and Titan with Metallic heads and premium effects. You won't be disappointed!! Superb entertainment and solid value. Expect to pay over £250 normal retail price. 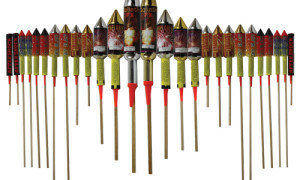 Includes the astonishing Tomahawk Rockets, the incredible double burst rocket Gemini, and the Goliath special effects rocket. Huge and powerful rockets for the serious display. 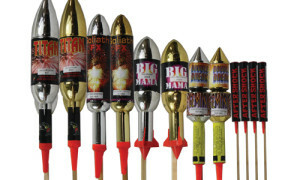 Features that awesome huge Big Mama Rockets with a new METALLIC head and the superb Goliath F\/X rockets. Our usual bargain price too with a retail value of over £400. Don't miss out! 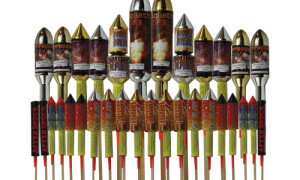 Our no holds barred rocket pack! All chosen for their outstanding value and performance. 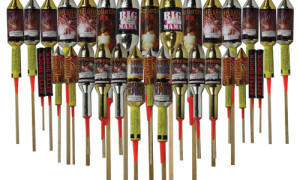 From the wicked noise of the Aftershock to the awesome size of the Big Mama you will not be disappointed! Some of the biggest rockets you can buy!